Make MIDI from monophonic audio. NAMM 2016: Playing a virtual instrument from a MIDI keyboard is fine if you have the requisite skills, but what if you want to trigger your plugins' sounds using another instrument - or even your voice? That's where Sonivox's new Pitch2MIDI plugin comes in. This is designed to take any monophonic audio input and transform it into accurate MIDI data in real-time. Said MIDI can be sent out of the plugin (so it can then be piped to any instrument you like), and there's also an internal synth that offers more than 100 sounds of its own. A feature list is below, and you can also find out more on the Sonivox website. 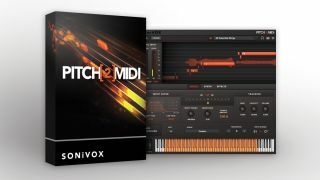 Pitch2MIDI is available for PC and Mac in VST/AU/AAX formats and costs $150.